I understand that our page was out of commission all day on Thursday, due to somebody at our ISP deleting every file in the cgi-bin directory which started with 'log'. The file directing you here happens to be named 'logit.pl'. 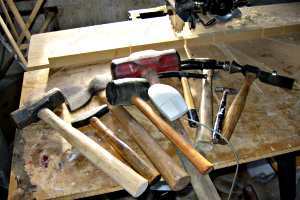 So, I'll replay Thursday's picture, which happened to be my collection of computer-fixing hammers. Maybe our ISP will take it to heart.